Technology has come a long way since mankind used rocks to start a fire. There was a time when the Internet was meant to serve Hypertext documents across a few machines. But today, we have reached a complex state where your heart rate is monitored by a device and then transmitted over to your computer. And if the heart rate is not normal, you might even see an Ambulance waiting at the end of your sprint. This is pretty much how we live these days. And to power such amazing features, we need to have amazing technologies. In this post, we are going to discuss two such bleeding edge technologies, the Ionic Framework and Firebase. What is the Ionic Framework? Ionic is a powerful AngularJS driven mobile web framework that makes building hybrid mobile application easy. Not only does it have the power of two way data-binding, it has an awesome interface for working with RESTful APIs. This makes Ionic a perfect match for developing apps and keeping them in sync across devices. There were times when provisioning a machine to deploy a simple website would take weeks. Then, along came Amazon. You simply tell Amazon what kind of system you want, and it provides a server for you. Next, we have seen the rise of Heroku, which provides a PaaS (Platform As A Service) to host your applications. This allowed developers to focus more on the application, instead of worrying about provisioning and deploying the application. And finally, we have Firebase, which is a self sufficient “Server as a Service” driven by a NoSQL data store. In Firebase, all you need to do is define a collection of data, and Firebase will take care of exposing it as RESTful API for you. I have written an article named Ionic Restify MongoDB – An End to End Hybrid App, which explains how to build an end to end hybrid app using Restify and MongoDB as the API server and Ionic as the hybrid client. In this post, we will see how we can completely eliminate the API server layer with Firebase. The Bucketlist application we are going to build will have an authentication layer, allowing the users to register and login. Once authenticated, the user is given the option to create a new bucketlist item. The primary view of the application shows a list of incomplete items and a secondary view to show the list of completed items. The user will have an option to mark an item as complete or delete it. Take a look at the live instance of the app. Submit the completed app to PhoneGap Build by forking the repo. Take a look at the complete code we are going to build. Our application will primarily consist of two layers. The first is the client (in our case, the Ionic App, but this could be any other client that can consume a RESTful API), and the second is the server (Firebase). 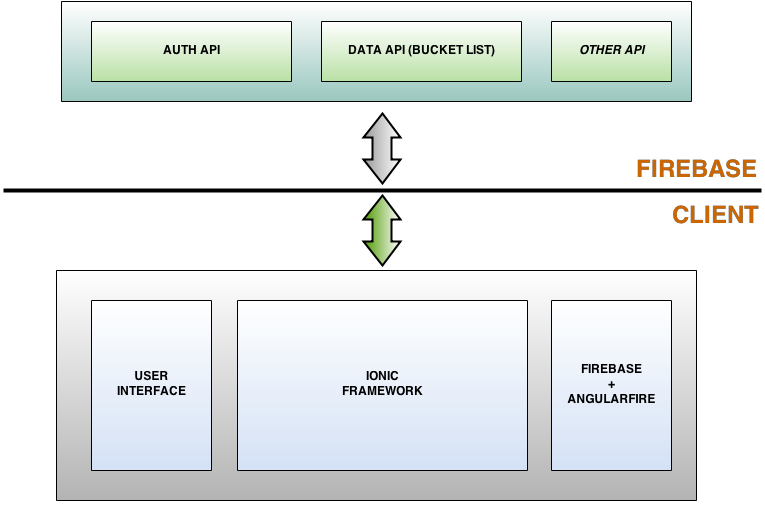 As you can see from the above diagram, on the client side we have an Angularfire layer which interacts with Firebase and acts as a service layer for the Ionic application. It is this layer that gives the power to keep the data in sync between Firebase and our Ionic client. On the Firebase end, we will configure a simple login to take care of the authentication. Apart from that, we will have a couple of methods that will take care of marking an item as complete and delete the item. Firebase is ideally used for real time data synchronization, where multiple clients across the globe are expected to see the same data at almost the same moment. This is not the case with our app. We are really not looking for a multi-device sync. All we need is for Firebase to take care of managing our bucketlist data for us. The awesome part of Firebase is that it provides an authentication API out of box. All we need to do is enable it and include the client, and Firebase will take care of the rest for us. For the bucketlist collection, we need a relation between the user and a bucketlist Item, kind of like a foreign key. This will enable us to show bucketlist items created only by the user. Unfortunately, there is no easy way to implement this in Firebase. Use location names and priorities intelligently. These approaches were kind of an overkill for a simple API. Then, I stumbled across this Stack Overflow post, that mentions how you can flip the data structure to be more user centric than feature centric. So I changed the app data structure as shown below. Note: I am not 100% sure if a large user base would affect the overall response time for a single query (more users = more collections ). We have a good idea as to where we are headed to. Our first step would be to setup a Firebase account, create a new Firebase application instance, and configure the authentication for it. Navigate to Firebase.com and create a new account if you do not have one. Next, navigate to the Accounts page and create a new app. Provide the desired name and URL. Once the app is created, click on the app name to navigate to the data and configuration page. This is a bird’s eye view of the backend. Feel free to browse around before you continue. Next, we will setup authentication for our application. Click on the Simple Login tab on the left hand side of the page, and in the main content area you will see the available options. Under the Authentication Providers section click on Email and Password and then Check the Enabled checkbox. This will set up the Simple Login for us. bucketListApp is the name of the application. This will scaffold the Ionic + PhoneGap template for us. Once the setup is done, the first order of business is to move the config.xml from the bucketListApp folder to www folder (A PhoneGap build requirement). to be sent to iCloud. Note: enabling this could result in Apple rejecting your app. Refer to PhoneGap 3 CLI Setup on Mac and Windows to completely understand and setup PhoneGap on Windows and Mac. You can use the above approach to test your code. But, you need to build the code for the respective platforms every time you make changes to the code in www folder. This will spin up a server. Now, all you need to do is open http://localhost:1881 and observe!. Note that cordova.js will be a 404 during development. And, since we added live reload support, all you need to do is make changes and switch to your browser to see the changes. Note: If you are building an app with native plugins like contacts or camera, this approach will not work! You need to deploy the app to the device to test it. Our Ionic app setup is done. let us get building the actual app. Notice that we have added a reference to controllers.js. We will resolve that in a moment. If you go back to the browser and check the developer console you will see a couple of 404s and an Uncaught object error. The Uncaught object error is because, we have updated the ng-app directive in index.html but not in www/js/app.js. You can kill the gulp task, as we are going to make quite a few changes. Once everything is done, we can relaunch the server. The primary dependency is ionic, next firebase, and finally the controllers. To develop our application, we are going use two pairs of ion-tabs component. The first set of tabs will be used to show Login & Register screens and the second set of tabs will be used to show incomplete bucketlist items and completed bucketlist items screens. Now, let’s build controllers.js. Create a new file at www/js and name it controllers.js. As the name suggests, this file will hold all the controllers. Next, creat a new folder named templates. We will populate each template as we go along. $rootScope.show(), $rootScope.hide(), and $rootScope.notify() are defined in app.js to show the loading overlay. $rootScope.auth.$createUser() is responsible for interacting with Firebase and creating a new user. Notice the various errors message that is returned by Firebase. You can find the entire list here. On successful registration, we will redirect the user to our primary view. $rootScope.auth.$login() is responsible for the Firebase authentication. $rootScope.auth.$login() returns a promise, which will be resolved once the request is completed. On successful authentication, we will redirect to our primary view. We have added a New button to the header. This will open a popup, where user can enter the item description and create it. The body of the view renders a card that will show the item description and a Delete and Mark as Completed icons. We will be buiding the Firebase Reference based on the logged in user, as discussed in the Designing the data structure section. We are creating a collection named after escaping the email address of the user. You can add escapeEmailAddress() definition at the bottom of the controllers.js. Next, we will use this dynamic reference to pull all the buckelist items using the on listener for value event. This will get triggered when ever there is a change in collection (One of the best parts of Firebase). We check if the item is not completed data[key].isCompleted == false, and then add it to the list of items to be shown. We also register the newTask(), that will open the Create New item popup. $scope.markCompleted() and $scope.deleteItem(), interact with the Firebase API to update the isCompleted value to true and delete a piece of data from the collection respectively. We build a form object, that will consists of all the essentials data to create a new bucketlist item. We will spawn a new connection to the user’s collection and then using $firebase(bucketListRef).$add(form); we insert the data into the collection. Once the data is inserted, Firebase triggers the value event, which will refresh our bucketlist items view. You can have not completed any of your Bucket List items yet. Try harder!! No Items in your bucket List. This will start the server. Next, navigate to http://localhost:1881 and you should be greeted with a Signin view. Click on Signup and register for an account. Once the registration is successful, you will be redirected to the bucketlist view. Play around with your new Firebase powered Ionic Application. Note: You can go to your Firebase app account and check out the data structure there too. We have successfully built an app that works fine in the browser. Let’s build a native installer and see how the app works on an actual device. Note: If you are new to PhoneGap, I would recommend reading the PhoneGap Quick Start before continuing. Step 1: First, copy the myIonicFireApp/dev/bucketListApp/www folder and its contents to myIonicFireApp/prod. This is all we need to issue a PhoneGap build. Step 2: Create a new GitHub repo named IonicFirePGInstaller. This will push the code to GitHub. Step 4: Navigate to PhoneGap Build and login. Step 5: Click on + New App and submit the GitHub repo URL (the https one and not the ssh one) under open-source. Now, the PhoneGap service will go to GitHub and fetch the repo. Once the repo is loaded, you will see a Ready to Build button. Click on it to issue a PhoneGap build. Once the build is completed, you can download the installers for your device and test the app out. This concludes the article on building a Hybrid app using Firebase and the Ionic framework. Hope you gained a fair idea on how to go about building one of your own. You can find the code base we developed on GitHub. You can find the www folder that you can submit to PhoneGap build on GitHub too. You can download the app installer here.